With a whole year of blogging together here at Tea in the Treetops behind us, I thought I’d take a look at what we’ve been reading and reviewing during 2014. I also wanted to take a look at my personal reading stats, since I feel like I’ve read a whole lot of YA sci-fi this year and very little of anything else, and I wanted to see if that was true! A small note: I apologise for the mess of graphs in this post, but the numbers geek in me really enjoyed this. Sorry! This year on Tea in the Treetops we reviewed 100 books and gave away eight. We participated in several blogging community events but one of the biggest was for Armchair BEA in May, where we published a number of posts to fit in with themes for each day. We also made a comeback to our Podcast with 14 episodes published this year. We have plans to continue with the podcast in 2015 so please stay tuned! This year has been an interesting one for me – you may or may not have heard that I had a little girl in early January, and was subsequently off work for nine months of the year on maternity leave! 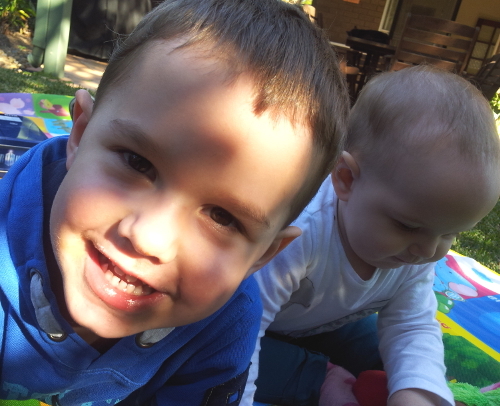 That’s my two on the right there – Matthew and Evie. I was surprised at the amount of reading I managed to get done through the year, but it certainly jumped up once I went back to work part time in October since I suddenly had commuting time to read. I read a total of 80 books this year, with a total of 24654 pages. This count includes fourteen short stories and novellas, four childrens chapter books I read to my three-year-old, and one cook book! 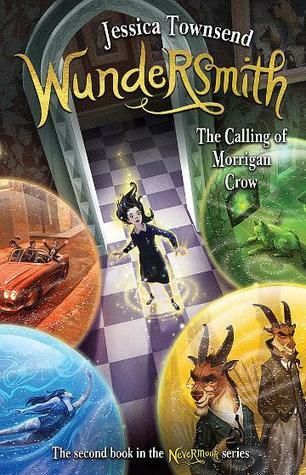 Of those, I reviewed 56 on the blog and/or joint audio reviews with Philippa, and ALL of them on Goodreads. Phew! Shortest book: Not counting the novellas or childrens books, the shortest book I read was Doctor Who: Touched by an Angel by Jonathan Morris, at 208 pages. Longest book: The longest book by far was A Feast For Crows (A Song of Ice and Fire #4) by George R.R. Martin at 976 pages. It took me the best part of a month to read! New releases (2014) vs older books: 50 books released in 2014. 9 in 2013 and 19 older than that. 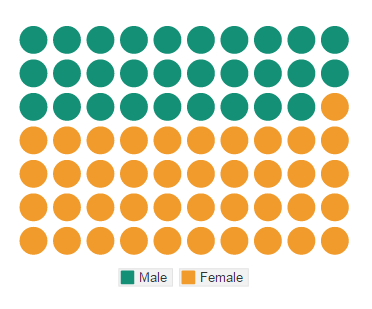 Male vs Female authors: I don’t generally choose my books based on the identity of the author at all, but after the post about the subject on the GR blog I thought I’d check to see how my authors are distributed. 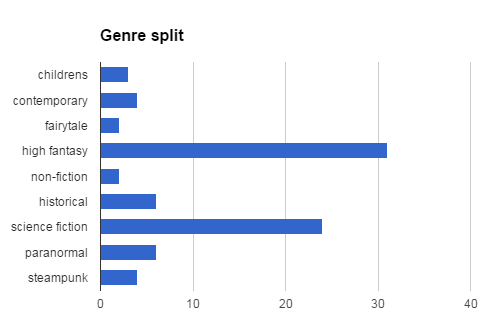 I have ended up with an approximate 3:2 split, but I suspect that’s because YA Sci-fi/Fantasy authors tend to be female. I haven’t been making a conscious decision to read more female authors, it’s just worked out that way. Age grouping: I actually read 33 books marketed as YA out of 80. Roughly 41% – much less than I thought. Genre split: By assigning a “main” genre to each book, I’m pretty evenly split between fantasy and science fiction this year. 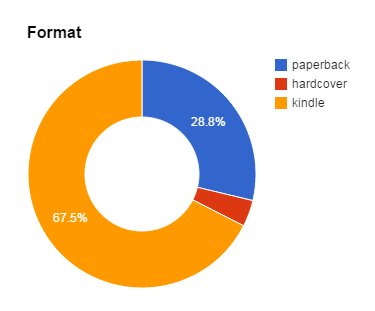 Format: The majority of the books I read this year were on my kindle. This is partly due to the e-galley factor, but also because it’s really very convenient to read on my kindle while I’m feeding my little one! Source: I’m actually quite surprised by the 28% owned copy count here. 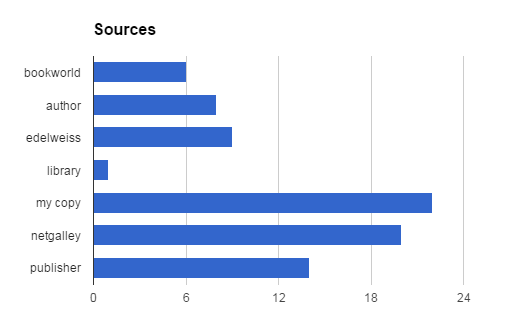 of the 72% books I received for review, most did come from Netgalley or Edelweiss, but a growing amount came directly from publishers this year. I’m so pleased to be able to build relationships with publishers in Australia and to be able to request books that I’m interested in! I’m also grateful to bookworld.com.au‘s Super Reviewer program which gave me a few more fantastic reads this year. Reading rate over the year: Here’s an interesting one. The horizontal axis shows the dates, so the wider a column is, the longer it took me to read the book. On average, I tend to read about 80-90 pages a day – more on days when I am able to read and less on weekends, usually. There’s definitely a trend where I read longer books more slowly – that is to say, my reading rate per day drops when I’m reading a large book. I’m sure there’s something psychological about that, although shorter books do tend to have faster pace and I’m more inclined to keep reading them to the end rather than stopping. Then there’s the huge books that I read really fast, like Endsinger, or the shorter books I read slowly, like Half a King. Of course there are lots of factors that affect reading rate, so the only thing to really conclude from this graph is that A Feast For Crows is a monster of a book!